Open Platforms: Perceptions and Realities What exactly does it mean to have an “open platform”? The perception is that an open platform has no restrictions or limitations; an open platform is agnostic. Yet reality is that there could be some limitations or restrictions. 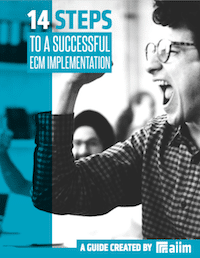 For example, there are ECM solutions that are built upon a proprietary database and are still considered to be “open”. The reason being they support a specific set of open standards for interoperability and integration. While the concept is sound, and many businesses look to a day where interoperability and integration across the enterprise is achieved, AIIM research finds that only 8% of organizations have accomplished this. As part of our Certified Information Professional Spotlight series, I chatted with Baba Majekodunmi, Business Analyst for Payment Products & Service at Pentagon Federal Credit Union, for his story on becoming a CIP. We have some really exciting news – we’ve partnered with the International Association of Privacy Professionals (IAPP) to offer 3 new ANSI-accredited certification training courses on privacy and data protection.